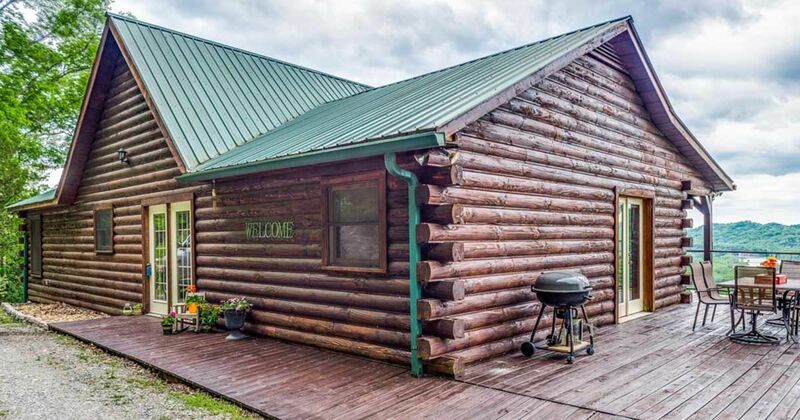 If you had to choose between living in a timber home or a log cabin, which would you go for? It’s not always necessary to choose. 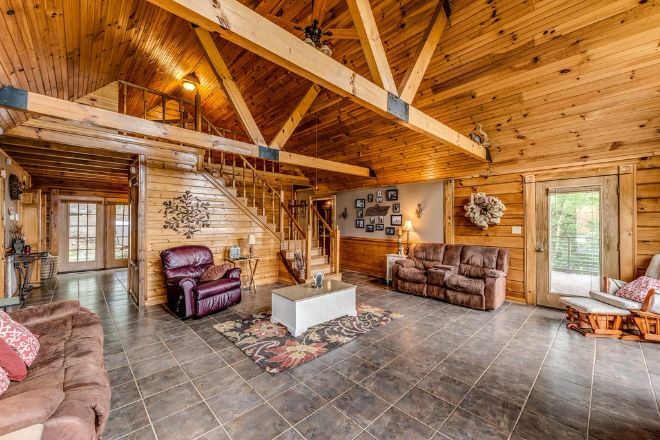 Many designers and builders these days combine the two, giving you the classic, and let’s face it – valuable, timber frame with the aesthetically attractive exterior of a stunning log home. 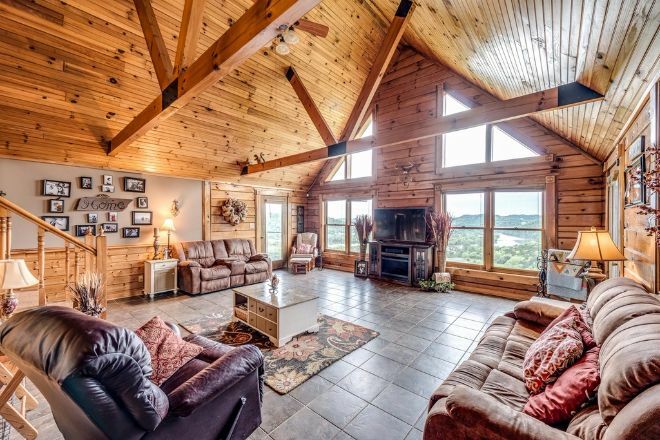 Set up on a hillside with dense woodland behind, this almost symmetrical timber-frame home offers incredible views of the surrounding area, as it stands on its 2.24 acres of private land. 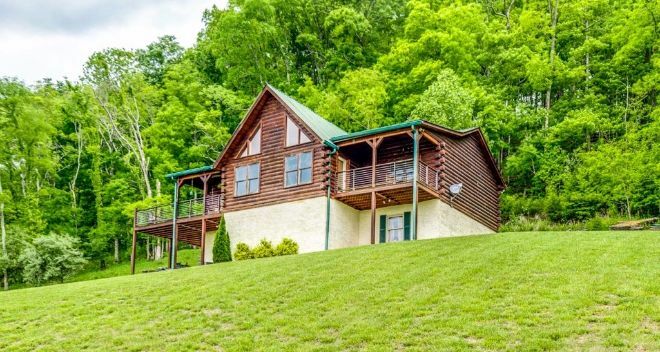 It features a characteristic, high, sloping roof; huge windows; and two side porches for additional exterior space, one of which wraps around the side of the home. Stepping inside to the front of the house is an absolutely enormous great room with an exquisite vaulted cathedral ceiling and traditional wooden beams. Just look at that huge window and the amount of light it lets in. We love how the fireplace becomes a central focal point, perfect for warming this room during the colder months. 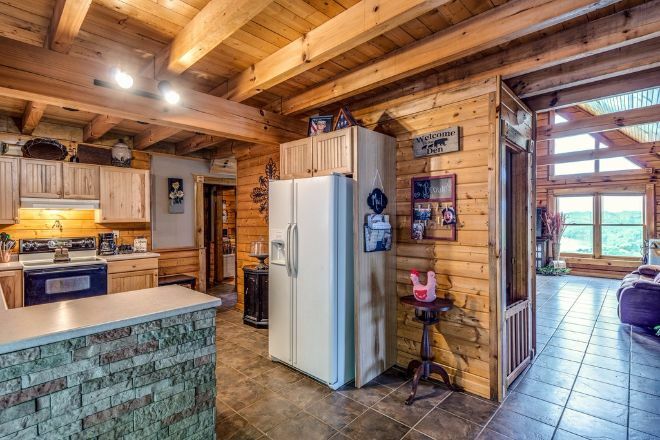 The kitchen is separated from the large living room by a small log partition wall, which also offers extra storage space. It is decorated in a rustic, farmhouse-style design – tartan patterned blinds, coal grey tiling and stained light wood cupboards. As a perfect family home should, this good-sized kitchen has all the modern appliances you’d expect in a contemporary timber house. 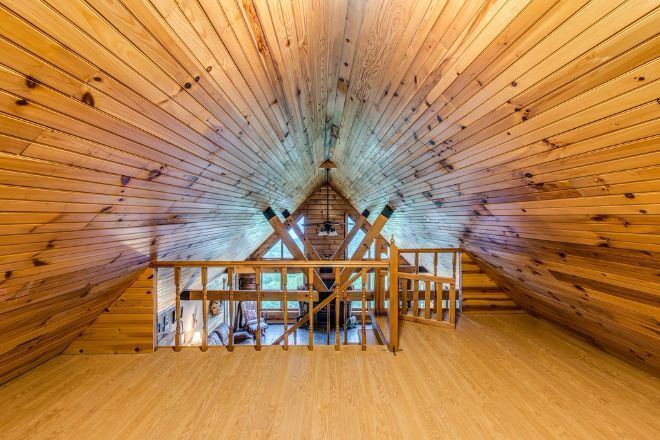 This hybrid log/timber home has 3 good-sized bedrooms, two of which have large built-in closets with matching wooden doors. 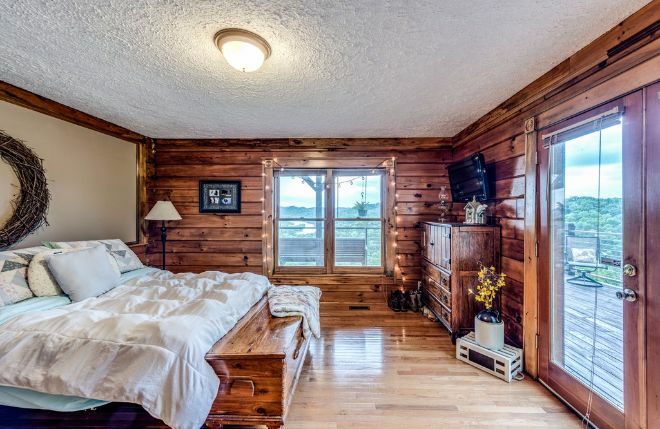 The master bedroom has a large patio door that opens onto one of the side porches; we can just imagine sipping our coffee here in the morning while taking in the view. 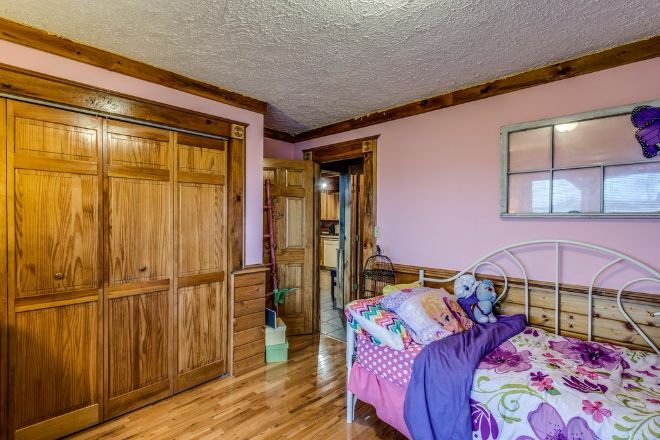 Off the master bedroom is a Scandinavian-style, fully paneled en-suite bathroom. 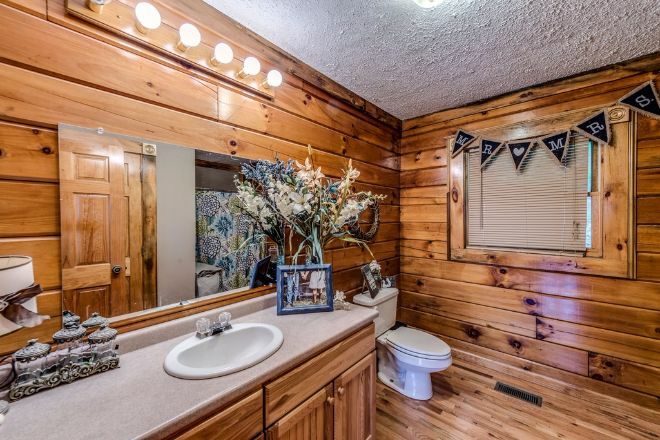 It boasts a large walk-in shower and plenty of storage built into the sink unit. 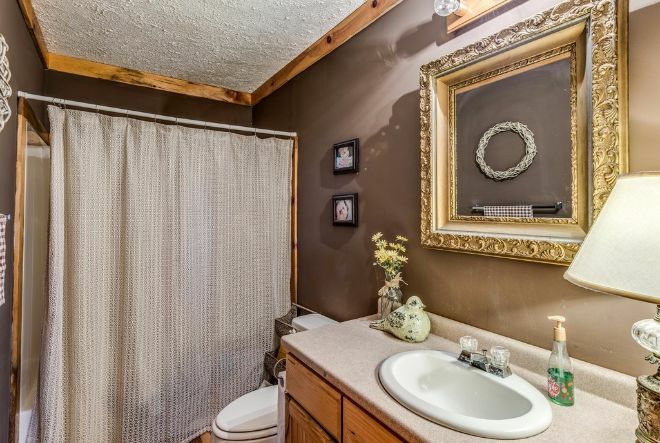 The second bathroom is also fully equipped, featuring a more modern decorative design. Above the living room with an overhanging balcony is a spacious loft space. Despite the lack of windows in the roof, it has plenty of light from the huge window at the front of the house. 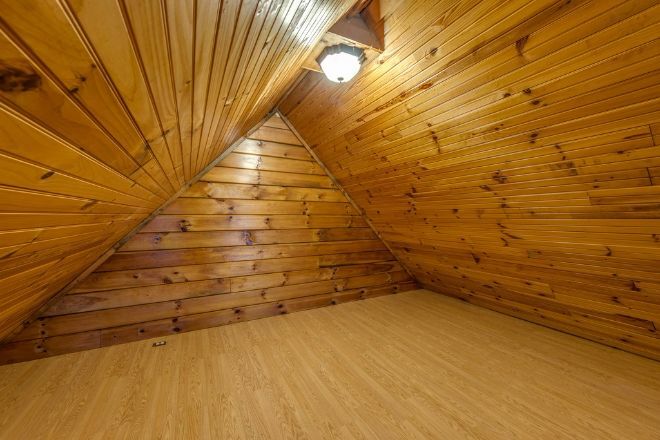 This room is a good size and could be multi-purpose – an extra playroom, sleeping quarters or even a small study. 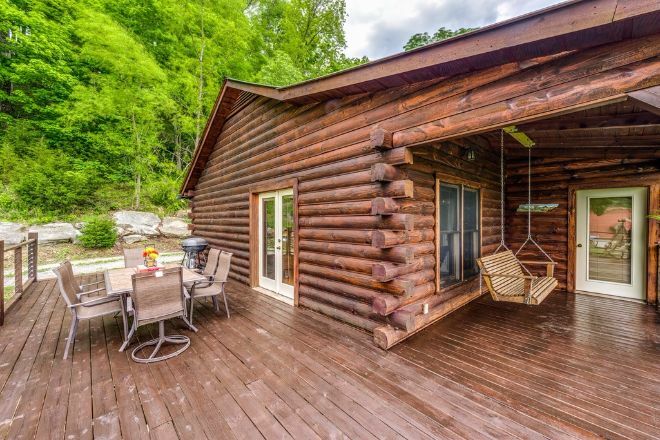 The outdoor wrap-around porch is truly lovely, and not just because of the views it offers. It has both an open and sheltered space with a large outdoor dining set, as well as a romantic swinging chair to cuddle up on and watch the sunset. 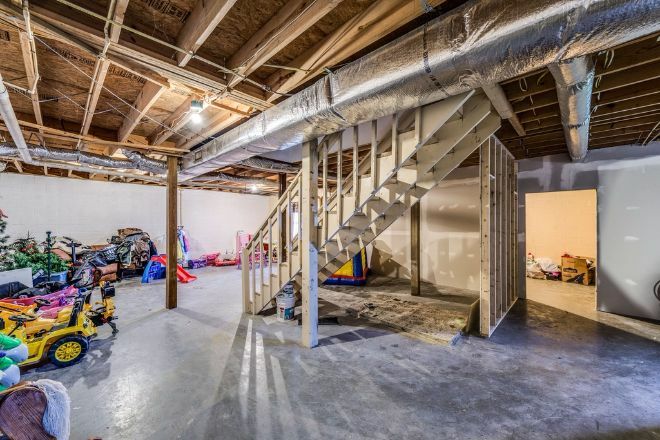 The basement of the house provides an abundance of storage space – cars, toys, spare furniture; it would be difficult to fill this area even for a large family. 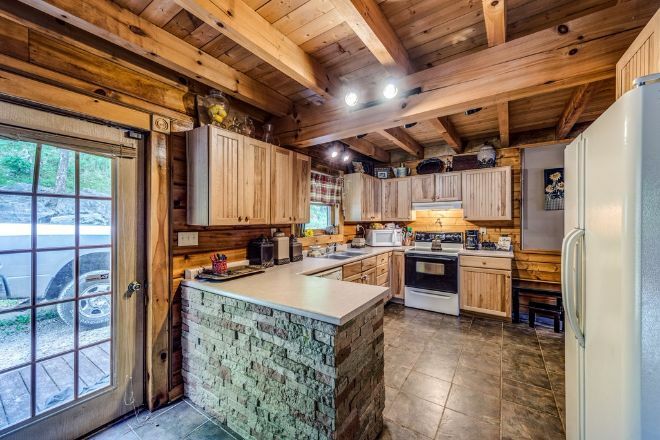 Is this Tennessee home everything you are looking for in a timber-frame home? LIKE and SHARE on Facebook!